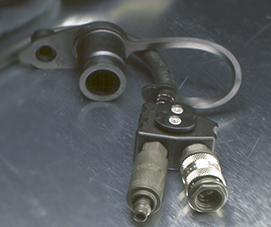 The DUAL EBSS hose is waist mounted and equipped with both female AND male quick disconnect and is used to supply air to or receive air from another respirator user. The hose may be connected to an extended duration air supply hose line to supply breathing air to the respirator user. The DUAL EBSS accessory hose is available for the SCOTT AIR-PAK 75, AIR-PAK NxG, and AIR-PAK X3 series SCBA. Need a price on Reconditioned Scott Dual EBSS (Emergency Breathing Support System)'s?